Lack of sleep keeps me happy and sharp. As a rule, I should really snooze no more than 2-3 hrs a night, if I want to stay on top of my game. And BONUS: Studies show that sleep deprivation may lead to an irreversible personality change, so there's always the chance that one of these days I'll blink and suddenly turn into a super suave, female James Bond, amirite? Awesome news: I need to find a photo and come up with my bio for our agency's website. Oh goodness, I have to be very careful how I present myself. If I sound like my usual self, I'll attract the crazies. But if I suppress my shenanigans, I might sound boring and blah and then who would want to query me? Sigh. This is going to take awhile. Oh yeah, I finished Mockingjay. Solid ending to a trilogy. FYI Gale, Finnick, and Cinna are joining my harem. BACK OFF! 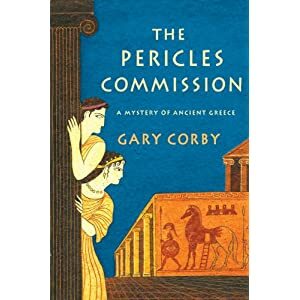 Now I'm reading Gary Corby's The Pericles Commission, a mystery set in Ancient Greece. The setting is so authentic and vivid, and Nico is such a funny narrator--I love it! I can totally see this as a TV show, kind of like ROME but you know...GREECE. Plus it's a lot funnier than Rome, and Gary's a master plotter of mysteries so yea. Can't wait for the train ride home so I can keep reading! Yep, The Pericles Commission was great! Good luck coming up with the perfect agent's bio. Are you going to link when it's up? God forbid you should ever become "blah", post as you are and let the crazies go wild..! I totally love Cinna! I'll have to check out The Pericles Commission. It sounds interesting. Ooh, love mysteries AND ancient Greece. Will have to check out! I have a feeling blah won't be a problem for your bio. :) Have fun networkin tonight. If you are looking for a good mid grade read try Nightshade City by Hilary Wagner...it's really good. I bought it because Hilary is an adorable blogger, but her writing is awesome! You're my best friend, Jude! I'm totally getting you to write all my blurbs from now on. OK, I have to ask. So who would you cast for Nico + Diotima? On the photo/bio/cards...does this mean people will now be querying you directly? Wait - did I miss an announcement somewhere? If so - congratulations!!! I remember there was a picture of you that you used as your twitter avatar - a green shirt (lol that's specific right?) It was very pretty. Have you seen Suzie's picture for her bio, where she's sitting on a pile of books? I LOVE that one. So perfect for her. Or, you know, you could use the General Hammie picture with your head photo-shopped on it. Oh wait - that would attract the crazies, but be really funny! :) I love that pic. So freaking cute. Hunger Games trilogy: I really enjoyed the series but was disappointed by the ending. I really expected a little more romantic of an ending. And I LOVED Finnck and Cinna too. The Pericles Commission sounds interesting! I'll have to check it out! oh I love anything Greek and romantic...and a little mystery is good. ;) I've not read the Hunger Games as yet but its on my list - hard to miss with so much hype! Good luck with your agency bio and photo. I remember seeing Corby's name around when he was looking for an agent. I'll have to check out his book now! Gary, I'll have to think about it for a few days, then I'll post my casting choices! Hm, I'm not sure if, like, I crossed the line and can now take on clients right away, but it seems like things are easing into that direction. So I'm guessing and hoping it'll be sometime...soon...? Shelley--thanks! I mean, it's not official yet. But when it is, I'll definitely announce it on my blog :)! Ooh yea, I like that picture too, but I'm afraid it's not very BUSINESS, you know? And my eyes are avoiding the camera, which says the wrong message! I'm thinking I need to look straight into the camera to exude a confident, professional vibe, I'm guessing lol. And you're right. I'm a sap for romance, so it would've been nice for Mockingjay to be more romantic, but I guess Suzanne Collins didn't want to go that route.